Cryoablation has been used for more than a century to ablate tumors in superficial structures such as the skin, cervix, and breast. More recently, its uses have been expanded to include the ablation of tumors involving deeper structures including the prostate, liver, and kidney. Initially, cryoablation was applied exclusively at open conventional surgery (40), but as the probe size has decreased, there has been more interest in utilizing cryoablation percutaneously. (58). Similar to RF ablation, cryoablation causes small blood vessels to thrombose, resulting in additional cytotoxic effects related to ischemia (41,68). However, the ''heat sink effect'' seen in RF is manifested as a ''cold sink'' in cryoablation and results in relative tissue sparing around large blood vessels (41). Vessels up to 3 mm can be completely frozen during cryoablation. Except for the small capillaries, these vessels often recanalize after thawing. Because the recanalized vessel is often perfusing necrotic tissue, there is a higher risk of postprocedure hemorrhage associated with cryoablation. Vessels larger than 3 mm tend to be spared, along with their perivascular tissues (69). The critical temperature required to accomplish complete necrosis of a given tissue is dependent upon the tissue type, but is typically between —20 and —50°C. This temperature is usually achieved within a millimeter or two of the edge of the iceball created during cryoablation (41,70). As a result, estimating the expected zone of cell death based upon the imaging findings is relatively precise. Techniques that can increase the efficiency of cryoablation include multiple freeze-thaw cycles, an increased rate of freezing, and colder temperatures (71,72). Two freeze-thaw cycles are standard at most institutions. 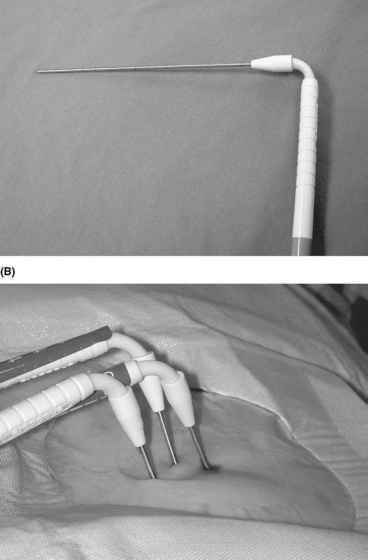 The development of argon gas-based cryoablation systems has expanded the use of cryoablation from a primarily intraoperative technique to its consideration as a viable option for percutaneous use. Early cryoablation technology utilized liquid nitrogen (LN2) as the cryogen. These systems were cumbersome, difficult to maintain, and required large probes (3.0-8.0 mm OD). The large probe size limited percutaneous use because of the difficulty and danger in placing such a large applicator percutaneously, but also because of the perceived risk of significant postproce-dure hemorrhage related to the large access portal. Endocare Inc. (Irvine, California) (Fig. 7) and Galil Medical (Wallingford, Connecticut) are the only two companies that currently manufacture an argon-based system in the United States. Argon-based systems function by circulating argon gas under high pressure through the probe tip. The argon gas expands rapidly in the probe and creates very low temperatures on the order of — 150°C (Joule-Thompson phenomenon). The argon gas tanks are smaller and can be stored for longer periods of time than LN2 tanks. The response times of the system are much quicker because the argon gas is relatively less viscous and therefore, more rapidly circulated. These systems use helium gas to speed the thawing process, which can significantly decrease the time necessary to perform an ablation. And perhaps most importantly, argon-based systems utilize smaller cryoprobes (currently as small as 17 gauge), which has expanded their use in image-guided percutaneous applications. The use of cryoablation has been primarily intraoperative in the past (73). In this setting, the probes are placed under direct visual guidance, usually in combination with intraoperative US. As image-guided percutaneous cryoablation becomes more prevalent, several advantages over the heat-based ablation modalities have become apparent. For one, multiple cryoablation probes can be placed simultaneously at the beginning of the procedure. They can then be activated simultaneously, creating a large conglomerate zone of freezing. This allows zones of ablation up to 12 cm in diameter, much larger than can be created with current heat-based ablation methods. Figure 7 Cryoprobes. (A) Argon gas cryoablation systems utilize probes with much smaller diameters. These systems have made percutaneous cryoablation feasible. (B) Because multiple probes can be placed simultaneously, large zones of ablation can be achieved. The low profile of these angled probes allow the patient to be placed in the CT gantry both during and after positioning. Abbreviation: CT, computed tomography. Positioning all of the probes prior to the ablation also allows more precise placement, because the targeted area is not obscured by the sequelae of previous ablations. Also, because the probes can be individually controlled, and the ice ball is easily identified with both US and CT, the shape and size of the ablation can be closely monitored and controlled. Overall, this can result in a very significant reduction in procedure time and improved control over the ablation zone, particularly when larger tumors are being ablated. A multiprobe RF system is now currently available and has shown promising results in animal studies (74). An effective multiprobe RF ablation system would obviate some of the advantages of multiprobe cryoablation. Cryoablation has been in use as an intraoperative technique for the treatment of RCC since the late 1990s. Early results show comparable local control and survival rates when compared with nephron-sparing surgical techniques (9-12). The safety profile may even be slightly more advantageous. 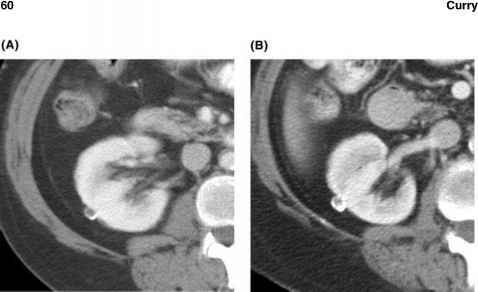 The experience with percutaneous cryoabla-tion of renal tumors is currently very limited, with no large clinical trials. However, early case series and case study results are promising. The largest series to date involved 19 patients, of whom 17 were successfully ablated at the first treatment. No complications were encountered (Table 2) (75). As with all the ablation modalities, repeat ablations can be performed as needed if the initial treatment is incomplete.